59963-SSSD-DST is rated 4.1 out of 5 by 54. Rated 4 out of 5 by Anne from Nice but some details could be improved. The installed set-up looks nice but the supplied soap dispenser base ring does not at all match the design of the other two pieces, it detracts from an otherwise nice design. Can I swap the soap dispenser supplied for a more similar base design or at least just the ring, I don't want to go and buy another one ?? The installation was simple enough, but the instructions could be improved. The water flowing through the valve and tubing is much noisier than the previous traditional kitchen faucet (non-pulldown, separate hot/cold) that I replaced. The pull-out sprayer doesn't fully retract on its own even with the weight they provide on the hose, I believe due to the roughness of the hose braiding running through the spout tube causing resistance, needs a smoother hose. Rated 2 out of 5 by Alex H from Poor Temperature Control Got this faucet a few years ago from Home Depot. Looks nice and everything still works, but it has one major issue. Since day one, it has been difficult to adjust temperature. 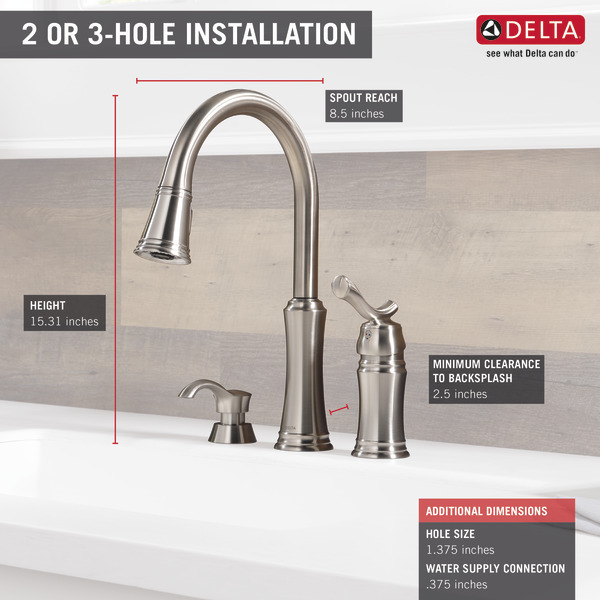 Faucets from other brands have a smooth and gradual temperature control, but this Delta Lakeview faucet is either freezing cold or scalding hot with an extremely small warm sweetspot (see attached image for explanation). Rated 4 out of 5 by dwheelerf5 from Amend prior product review I wanted to amend my original posting but could not find a place to do so. My faucet, of less than 3 years, began to drip at the faucet head due to a faulty switch from stream to spray. Water would come out of both parts. I was concerned that this faucet should become faulty so soon. I finally called and spoke to a very friendly customer service representative. After a few pertinent questions, Delta sent me a replacement head. I installed it in less than 5 minutes and it is working normally again. Thanks Delta for the prompt service. Rated 3 out of 5 by dwheelerf5 from Button to switch spray patterns drips The design of this faucet is great and versatile. 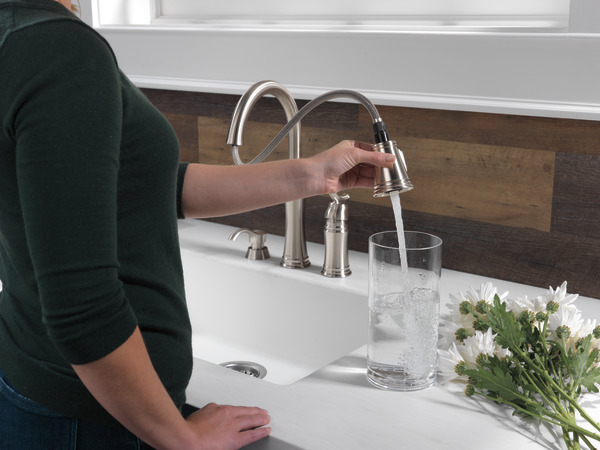 However, after about 3 years of use, the button that switches spray patterns does not close properly allowing water to flow or drip from both patterns at the same time (spray vs. stream). I changed the aerator and soaked the head in vinegar with no solution. I then soaked in CLR, again no solution. For the cost of this faucet, it should last more than 3 years. 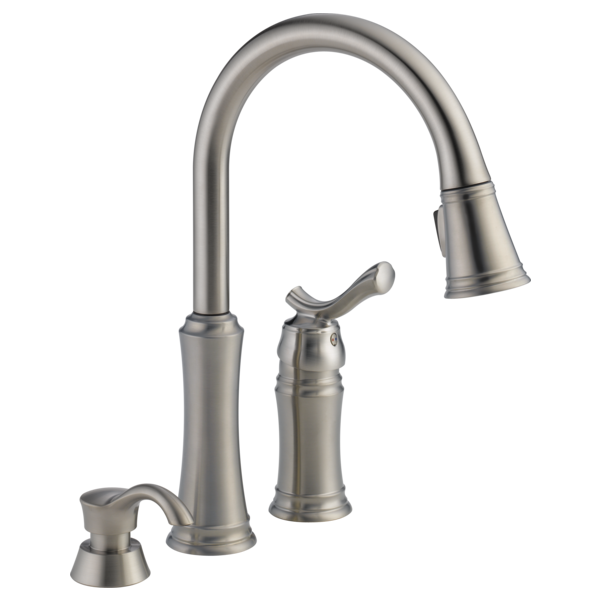 Rated 4 out of 5 by Jdamozon from Love the design Our family is thrilled with the faucet. 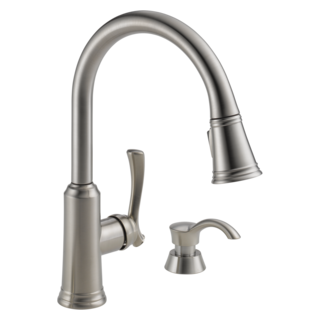 Rated 2 out of 5 by AnnieG from Handle is loose We've had this faucet for about a year. But now the handle is loose and the faucet drips. We have tried to tighten it but that doesn't work. We're now looking to replace it. Very disappointed. 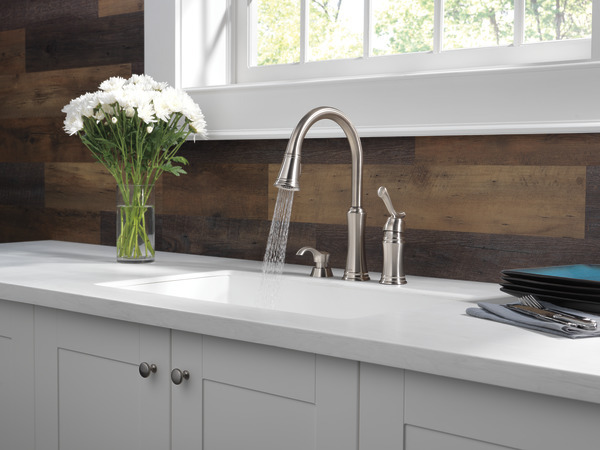 Rated 5 out of 5 by Kathy from Beautiful, solid and sturdy at the same time The finish is gorgeous, and the faucet looks classy and is also very solidly made. Rated 2 out of 5 by srichey from poor flow and hot temp. I just had this professionally installed and the hot water flow is half the cold water flow. When I have the water temp. at 100% hot, it doesn't get as hot as my old unit. can the Lakeview be installed with spacing other than 4 inch centers? I have had in past one center hole for main faucet w integrated control lever --- second hole is 7.5 inches on center to the right of the main faucet hole and was for a hand held spray , soap dispenser is way to the left 18 inches from center faucet hole so I need 3 &quot;components&quot; for the 3 holes but was not sure if the main faucet and control lever for the Lakeview have to be 4 inches on centr apart or can they be spaced further apart?? - assume soap dispenser is separate and not critical on spacing? What is the absolute minimum clearance between the back-splash and the base of the faucet? I see the spec sheet says 2.5&quot; clearance to the back-splash but I don't see why so much space is required. Our current faucet sits almost against the back-splash as we have a narrow space behind our sink, and the current faucet is 2.25&quot; diameter. 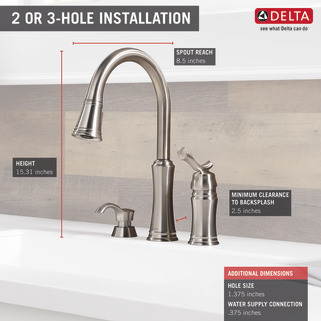 If this faucet will not work in this configuration can you recommend another Delta product that will? Thank you. Can the water supply lines be cut to fit? Can you please tell me what the height of this faucet is, at the highest point of the arc? I'm trying to determine if I have room under an above-sink shelf. Can the Lakeview faucet head be replaced with the new Shield Spray head? If it can please supply the part number. 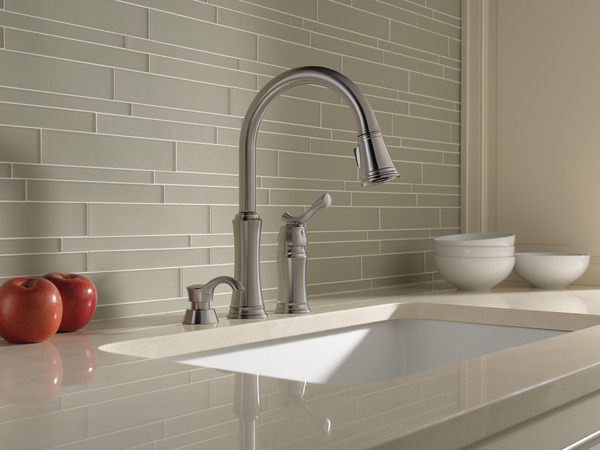 Can I get a replacement &nbsp;soap dispenser for the lakeview faucet matching original?